When you arrive at college, in particular UT, it's very important to note that the entire experience is designed to be a challenge. Earning grades is not something that will come as easy as it did in high school and asking for a helping hand is not a sign of weakness here. Many people use college tutors to help them understand concepts and eventually achieve better grades in the course work at UT. If you are having trouble in college math, physics, chemistry, or other classes, college tutoring is one of the best ways that you can adjust your strategy of learning. The problem, if you want to call it that, with college today is that so many people are going, and university attendance numbers are growing. This means that classes at the University Of Texas in Austin are expanding to the point where several hundred students are all in the same room with only one professor and several teaching assistants. Unlike class sizes in high school where you may only share a classroom with about 30 other students, the professors and teaching assistants will not have time to meet with each individual student to explain concepts. Instead students are left to their own learning strategies and are required to master a lot of content in a very short time span. Using the services of a personal tutor in Austin will aid in your understanding these concepts. A tutor can help you adjust your studying strategy, correct your homework, help you with writing a paper and more. Spending the time to correct and proofread your work in college is absolutely crucial and having a 99Tutors tutor available that can proofread your homework and make corrections at any time is an excellent resource to have. Many people depend on other students for proofreading services but trusting in a tutor who has already taken the course, will give you an advantage as they already know the requirements for the paper and homework and how it will be graded. Using a qualified tutor means that all of your work can be structured to earn the highest grade and give you a big boost in classroom and online courses. Working with the assistance of the 99Tutors tutoring service will allow you to learn new strategies for studying, help to correct your work and also give you the time that you need to learn difficult concepts with the help of an expert. With all of these advantages you are bound to see an improvement in grades. 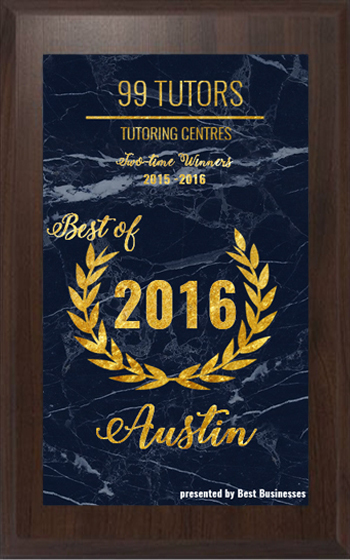 Contact us for questions about Austin TX Tutoring directly at 512 354 7656.